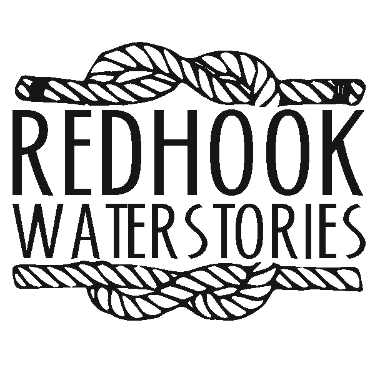 A fair portion of today’s Red Hook was once water. An 1887 article in the Brook Eagle marvels that Henry and neighboring streets have been extended nearly half a mile in ten years. Marshes with knee-high water, or deeper, were being systematically filled with building debris and refuse, extending the land block after block. Most of the area was claimed by the estates of Beard and Robinson but a number of pre-existing houses were already there that belong to, as the newspaper called them, ‘squatter sovereigns’ who lived in the area when it was still marsh. Many of the houses are brick or clapboard, but a fair number are made from salvaged tin ceilings. 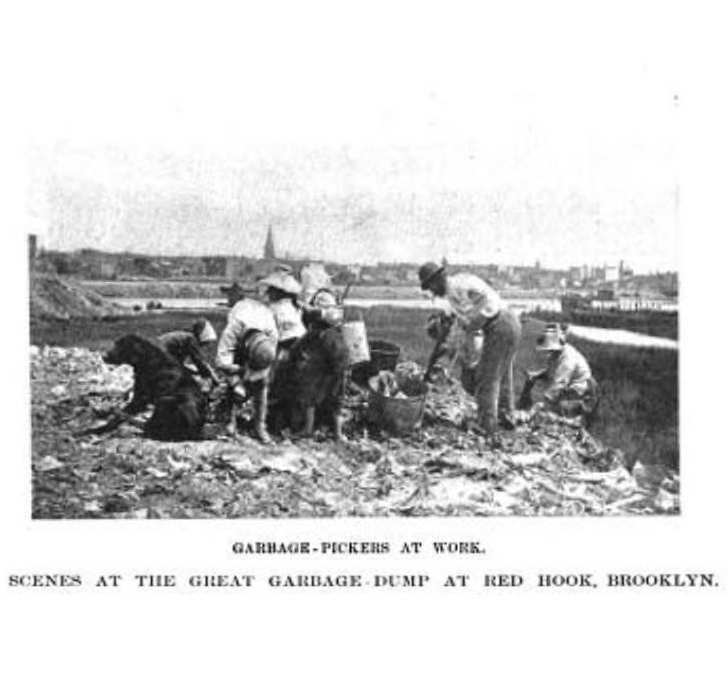 Salvaging was a good source of income for the residents who sifted through the regularly arriving dumps of fill for salable material ranging from old rag paper and shoes to bricks and tin cans. More than eking out a living some were able to enjoy comfortable lives in homes they owned. 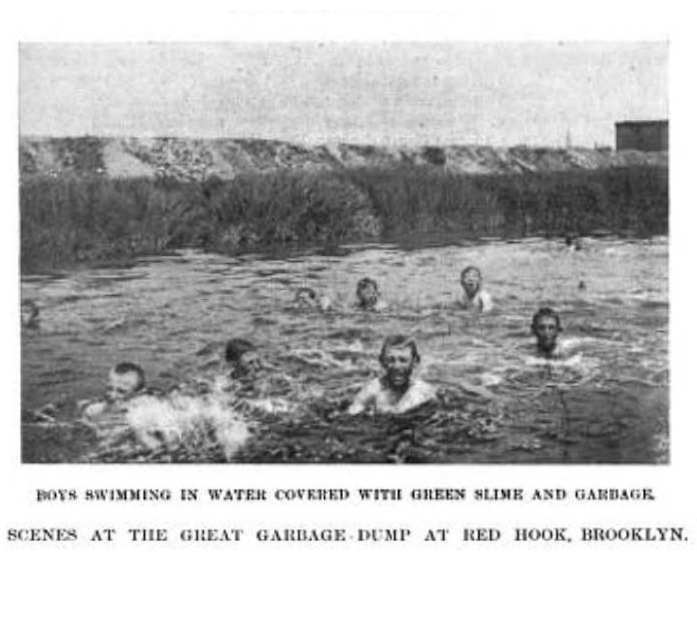 This practice had been going on since the 1830s, as the rest of city looked for a place to put their debris and Red Hook developers looked to turn wetland into dry land for warehouses and factories. A Walk at the Lower End Well Worth Taking. The Growth of a Year and a Half – Squatter Sovereigns – Side Thoroughfares and Their Occupants – More or Less Valuable Pickings. If a Brooklyn citizen were to take a walk to the lower portion of Henry Street he would be surprised to see how far that street has grown in the past ten years. During that time it has extended its feet into the water block after block, that has been made up in the same way as the extension of Henry Street, until 2,250 feet have been added to its length. 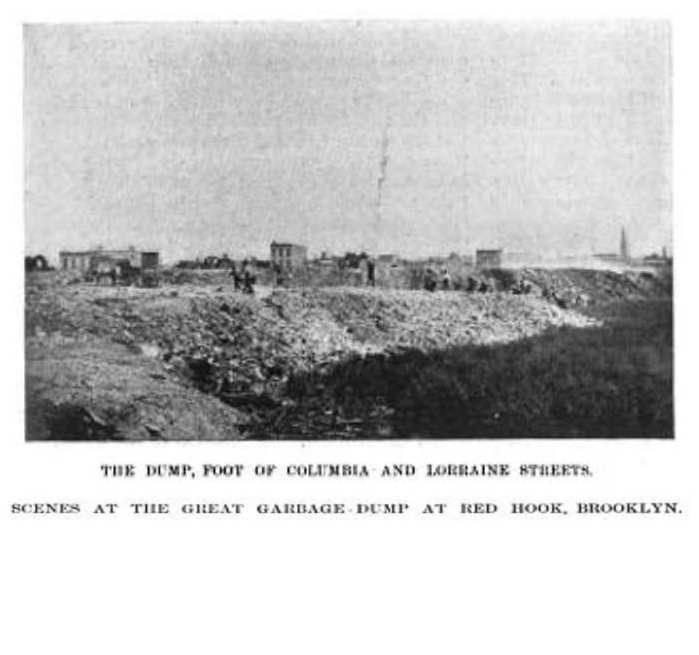 A year and a half ago Henry street was a sewer from Hamilton avenue to Gowanus Bay. Now it is solid ground for the same space crossing in that distance eight streets that have been made entirely, except the last two, Grinnell and Bay, which are now being filled. The other are Huntington, Church, Garnett, Center, Bush, Lorraine. All of these have been reclaimed from the waters of the bay. In the other direction about 4,000 feet have been added, covering Smith, Court, Clinton, Henry, Hicks, Columbia and Van Brunt Streets. 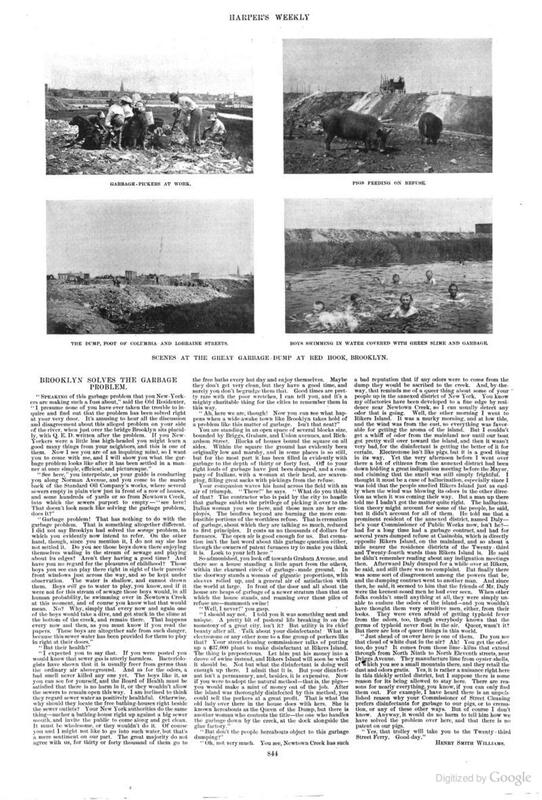 The lots as well as the streets are either entirely filled, or very nearly filled, so there has been practically added to the landed area of Brooklyn City a space of 4,000 by 2,000, 250 feet on nearly four-fifths of a mile by nearly half a mile. The lots now being filled from what is known as the Bushnell property, belong to the estate of Beard and Robinson. A number of houses have been built upon the tract. They are mainly owned by parties who originally were squatter sovereigns of the locality when they could wade knee deep in water all about the neighborhood. Most of the dwellings are of a story and a half. In some a cow can be seen chewing her cud peacefully in the basement, while the owner of the house sits in the porch above smoking his pipe of his wife is ironing the family linen, or more probably muslin, on the table by the window of the first story. Many of the houses are clap boarded and a few are of brick. But in a large proportion old tin roofing wrenched from some dwelling in more tony neighborhoods, enters largely into the construction. On some it enters into its old occupation of shedding the rain drops that descend upon the just and the unjust alike. In others it forms the entire sides of the dwellings. Indeed it appears that the dwellers in this new made land no sooner see a bit of discarded bit of tin roofing than the set about making it useful. If it doesn’t make a roof, a chimney, a door, a window, a siding, a pen for the pig, a barn for the cow or horse, a shed for the wagon, it is made into a fence to surround any bit of enterprise in the shape of a vegetable or flower garden in which the fancy and labor of the owner or the housewife have found agreeable exercise. It is an ill wind that blows nobody good and the gentle zephyr that tore the roofing from its fastenings or the hammer whose claw ripped it up did a world of good to the men and women of the dumps. The locality is surrounded by objects of interest. In the forefront the black hulls of great ships look up at Poillon’s shipyard. On the right the buildings rise along the front of Erie Basin. To the left the sail of a sloop just out of Gowanus Canal can be seen above the roofs of the low standing cabins. On the crest of the hill beyond gleam the monuments of beautiful Greenwood. The estates have a man in charge of the ground, who directs the cars to dump their loads her or there as desired. Refuse comes in all shapes. Now it is a load of cellar dirt, next a load of ashes followed by old bricks mingled with general refuse. The agent scours the city and secures all the dirt he can, for the sooner the space is filled up and made solid, the better he likes it. Some of the streets that have been made are composed of broken brick. The more aristocratic have a heavy layer of coal dust and cinders. At the corner of two of the streets rises a huge pile of bricks that have been picked up when dumped. The scene is enlivened by hers of goats browsing on the bits of paper or old shoes that have escaped the quest of the nabbos who rake the lane over almost with fine tooth combs. A Turk, with his tray of oddities, wanders drearily about in vain in search of a customer. Seated on an old tin pan with his back to a post, is the director of operations, reading a newspaper or studying his diagram of the property on which the lines and figures if all the streets are laid down. As a cart comes up he directs the driver where to dump it and then resumes his reading of studying. It is said that Chinamen will take the tailings that an American miner has cast aside as unworthy of further attention on his part and make a good thing out of them. But it would have to be a very good thing indeed to equal what has been raked and scraped and picked off this made ground by busy hands. Those hands belong to persons that are credited with having made fortunes out of what they have picked up out of the refuse. In a low house painted green, on the southeast edge of the tract, lives a woman who owns two or three nice houses, besides the one she occupies. She is credited with having raked an picked those houses from the dumping grounds. At least, she has picked out the rags, tin cans, old paper, bottles and the like and turned them into money enough to build the houses, and she owes no man aught for them. There are weird rumors that there have been finding of more value, finger rings, lockets, bracelets, nice silk hose worn by fair ladies, knives, forks, spoons, kitchen utensils. The variety of old shoes is very great and comprises high heels, low heels and no heels at all. Quite considerable quantities of iron and steel are found, and tin cans are looked upon as quite profitable bonanzas. The brush is burned. No use so far has been found for the masses of old rusted wire that are quite frequently dumped on the lots. 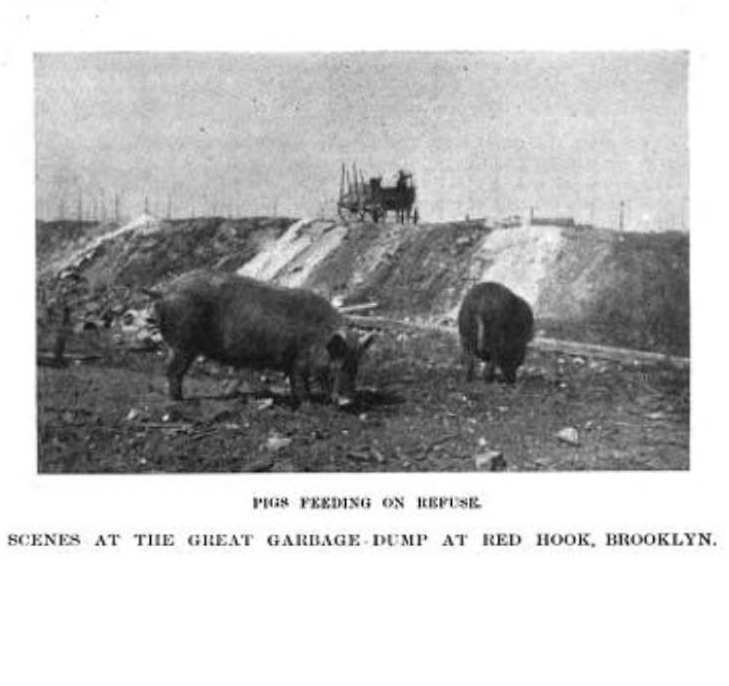 But one thing is certain, the cast off refuse of Brooklyn has mad a number of people rich, at least moderately so. Nother fact is made to appear very clearly, that it is very hard to utterly wipe out anything that once had a material form. A tin can may be battered out of all shape, but the substance of it will still be there. The dumping ground aristocracy sell that substance for profit, and it goes on to enter a new field of usefulness, with all its dents rolled out and it bottom facts made into new forms of utility. The rag picker and the philosopher can walk side by side on the dumping rounds, and each mad a profit.